PicPick Tools, one of the most promising screenshot tools, had recently changed to more restrictive license – no more commercial usage. Technically anything for this blog is commercial usage (I have ads), so I took this as opportunity to look for alternatives. And while I am looking I rolled back to one of staples – MWSnap, old but functional and convenient screenshot app. Well, takes screenshots. Unfortunately app hadn’t been updated in years, but even being that old it already has staple additional functions like region capture. It also has not directly related, but commonly included tools – ruler, zoom, color picker and less common window info tool. Rectangle area captures (freeform and fixed size), which I use most, work nicely. Captured image gets displayed in internal viewer and can be optionally copied to clipboard at the same time. Other output options are automatic saving to file and printing. There are some tools to edit image, nothing interesting except tool to add cursor to image. Much more convenient then trying to capture cursor in image like most tools do. Too few tools in editor, but that it if you need those. Zoom on freeform rectangle works fine enough, but on fixed it shows center of rectangle – quite useless with larger dimensions. Time-proven tool with portable version available, that is free for commercial usage. Latter seems to be harder and harder to find in modern screenshot apps. You could always use the old version. Usually they’ll be good enough for the job for years. 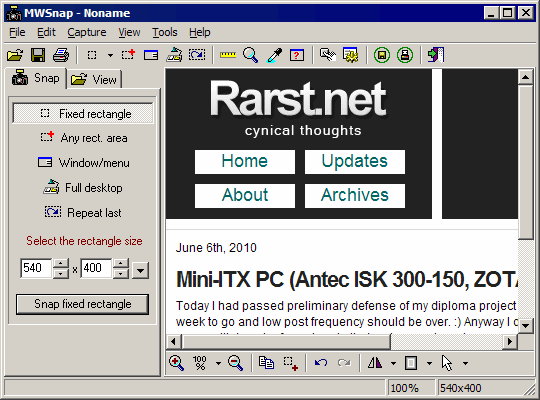 I did the same with the old free version of Faststone capture, which was the only one among several other screenshot captors I tried which managed to capture Rainmeter widgets on the desktop.I did not try Picpicks and am not sure whether I tried MWSnap. Clarification: I was referring to the old free version of Picpick in my first line and not MWSnap which itself is old. I know. I just decided its time to look for alternatives. :) PicPick didn’t get some functions by now and staying on old version is essentially discarding those for good. I used old FSCapture a lot, but it is also non-commercial use only btw. You can try Greenshot (http://greenshot.sourceforge.net/) is quite similar with MWSnap. Tried that one yesterday. Lacks zoom, I like to see precisely where I start and with my poor eyesight that takes some magnifying. I personally think that Mirek (or whatever his name is) died years ago…he could really have something huge if he updated MWSnap a little. Well, his site is kept alive, even if not updated on some years. I had it checked out with VirusTotal Uploader and it came back that there is a 4.7% chance that the new version has a keylogger or other virus in it… anybody confirm or deny? If you got something from non-official site that claims to be newer version than listed there – it it very likely to be a trojan indeed.